It looks like there may be a glimmer of hope for Bay Area public transit. In the Regional Transit Feasibility plan, developed by Jacobs Engineering, Bus Rapid Transit (BRT) has become the leading option. 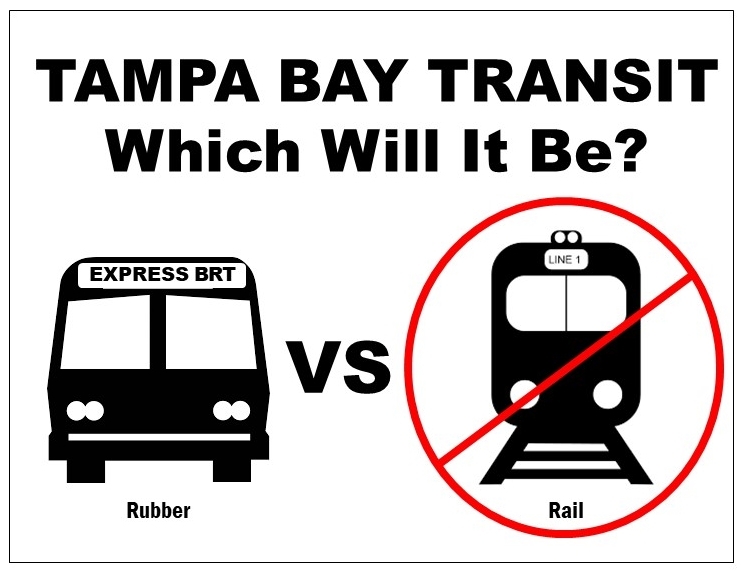 Tampa Bay’s transit future: Light rail’s out. Rapid buses are in. Tampa Bay Transit: How rapid buses left light rail in the dust. It would seem that the Jacob’s Team is not only technical adept they are also pragmatic. Following two disastrous attempts at referendums to fund light-rail and transit-oriented redevelopment, the Jacobs team is recommending a 40-mile BRT route that will connect Wesley Chapel to downtown Tampa and on to St. Petersburg. The local light rail supporters are waxing pragmatic also. From the Johnston article, "Candidly, I’m tired of talking about it," (Bob) Buckhorn said. "We need a victory. .?.?. I can say with a great deal of certainty if we move toward a BRT model using the existing interstate, we can get this done much more quickly than another prolonged debate in a political referendum about whether or not rail is appropriate for our area or not." And St. Pete Mayor Rick Kriseman, "Unless we are willing to ask the public to tax themselves significantly in order to make it happen," he said, "then realistically, light rail is really not going to happen." There are still a lot of problems to over come and the Jacob’s study will be part of a larger plan developed by the State, Hillsborough and Pinellas Counties along with St. Petersburg and Tampa. Don’t get too excited yet we have a long way to go and those who fortunes are tied to light rail may yet still try to thwart a rubber tire based solution. More than one consultant’s report has been quietly placed upon the shelf to slowly sink from relevance. There are other issues like the proposal in Senate Bill 1200 and House Bill 525 to take funds from rail transit and support alternative transportation systems, which could include BRT. See my Post: State wide alternative Transportation Authority More money down and old rat hole. Once TBARTA gets their hands on these funds watch out for a “new” study to be funded that will contradict the Jacobs study as TBARTA tries to slow down any non-light rail approach. It is almost unfair to ask TBARTA that has spent years and millions of dollars trying to get a light-rail proposal funded to switch hats and actively and professionally support the very thing they have fought for so long. Too many years, too many friendships, too many intertwined relationships with politicians, developers, consultants and light rail promoters for the alternative transportation money and BRT to get a fair shake. TBARTA should have never been “re-invented” by the State revising its charter; TBARTA should have been eliminated, and a new organization with a completely new staff should have been created. Even the quotes from Buckhorn and Kriseman leave the light-rail door open and any hint of questions about the viability of BRT will send the boys running back to the tracks. 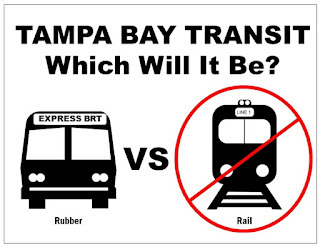 If Buckhorn and Kriseman are serious about the “need for a win” they need to get with their Pinellas and Hillsborough County counterparts and either get the $25 million from the State diverted to a different source or make sure they have enough control at TBARTA to ensure these funds aren’t spent to crash the BRT project before it gets rolling.